Your flooring gives you more than a smooth surface to walk on. The color makes a statement about your home. The material affects your everyday cleaning routine. And the texture influences your overall comfort levels. 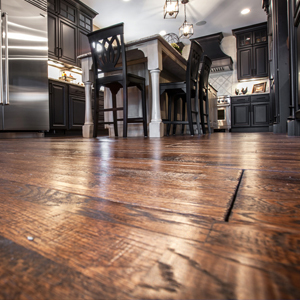 At Callier & Thompson, we recognize that quality flooring can boost your home's resale value and improve your kitchen's functionality and appearance. So to better serve you, we install flooring in St. Louis and the surrounding areas. With our help, your flooring will look fantastic for a reasonable price. When you think about your home's overall mood and theme, do you envision a natural warmth? A sleek and modern design? An elegant yet inviting atmosphere? Additionally, we only offer materials from the most popular brands, which you can browse below. When you choose from these manufacturers, you can rest easy knowing that your new flooring will be versatile, beautiful, and durable. Don't feel comfortable choosing a brand just yet? You can base your designs on what you see in our bath portfolio and kitchen portfolio. Just let our team know what look you want, and we'll handle the rest. Callier & Thompson has provided quality flooring in St. Louis for many years. We've learned what clients need to feel comfortable in their kitchen and bathrooms, and we understand that you have to stay within budget to afford your project. Consequently, our team carries a variety of products in a range of prices, so you can select what appeals to you most. To consult with our designers, call 636.391.9099. You can also stop by our showroom to see some of our materials on display.